One of the main debuts at the 2018 Moscow International Auto Show is the Lada 4x4 Vision. As its name suggests, it previews the design of the next-gen Lada 4x4. The Lada 4x4 Vision rides on a special platform, which was reported in the Russian press as a version of the B0. 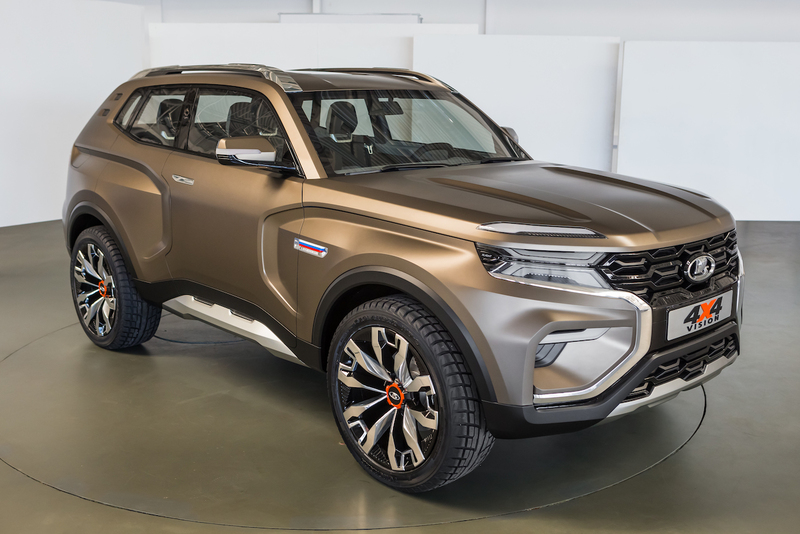 The Lada 4x4 Vision concept has a very aggressive front fascia, high-positioned flattish hood, high shoulder line, scaled-down glass areas and flared wheel arches. While the old model is skinny with a tiny footprint, the next-gen model is bigger and has a marked presence. There’s an “X” graphic all around, representing Lada’s new design identity, in the headlights, the front fascia, the side body panels and the side doors, and the tail lights. Lada has created the 4x4 Vision in a 5-door version to appeal a wider audience. That’s not to say that the next-gen Lada 4x4 won’t have a 3-door version, however. There is still some potential for 3-door 4x4s, as proved by the all-new Suzuki Jimny in Japan recently. The interior of the Lada 4x4 Vision in from 2018, and there’s not even hint of cost cutting. As it's a concept, Lada has thrown in some fancy gizmos, such as a large virtual instrument cluster and the minimalistic steering wheel with what looks like touch-operated controls. The orange highlights and trim and X-shaped elements and graphics add funkiness to the interior. The Lada 4x4 Vision is a five-door model. Lada hasn’t released complete specifications of the 4x4 Vision. All that the company has said is that a special platform underpins it and that it has a length of 4.2 metres. The Russian web media has reported that the Lada 4X4 NG will ride on a version of the B0 platform. The concept features LED headlights, LED turn signals, 21-inch wheels, LED tail lights, large floating central display, rotary drive mode selector (Sport, Mud, Snow, Sand and Eco) and dual-zone automatic climate control. Russian reports say that the next-gen Lada 4x4 will arrive by 2021.